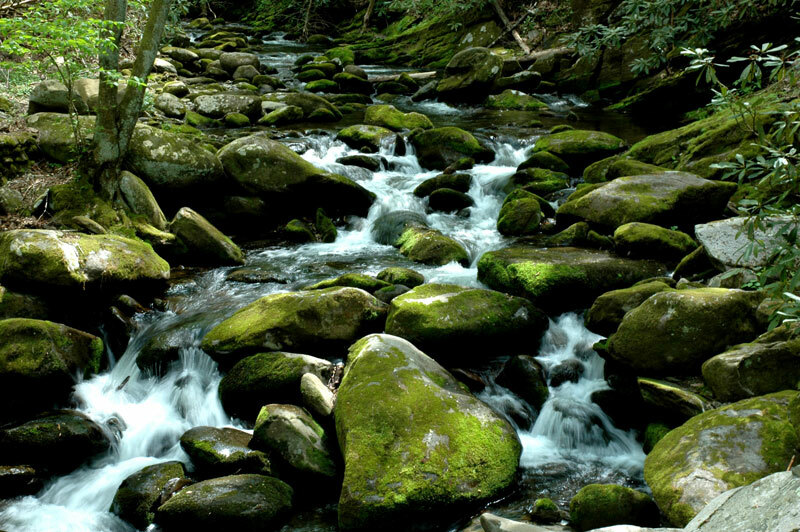 The Gatlinburg TN Arts and Crafts Community and Roaring Fork Motor Nature Trail would tie with Cades Cove for first place on a must do list for a visit to the Great Smoky Mountains National Park. If it’s possible, I think Roaring Fork is even more beautiful than the Cove. There are a million people strolling through the naked city, sorry, I mean walking the strip in Gatlinburg, but very few find their way to the Motor Nature Trail! It is a one-way 6 to 8 mile road (depending whose account you are reading) that winds its way through a heavily forested area replete with streams, waterfalls, flowers, rocks, boulders, trees and bridges. Throw in a few old homesteads. Don’t drive anything bigger than a pickup truck, or you won’t be able to make the 90 degree turns required to access some of the single lane bridges. The last three miles are my favorite with one photo op after another. If you are driving this without stopping at our Smoky Mountain Bed and Breakfast first, stop at the entrance and pay the dollar to purchase a leaflet entitled “Roaring Fork Auto Tour.” It is a marvelous read that takes you from a stroll through the Garden of Eden to reading about the reality of living there 160 years ago. If you are staying at Gracehill, I have several copies. Read it the night before and take it along for your drive. If you are following the map on this page, you will come out at the upper end of Gatlinburg. Go to stoplight number 8 (Airport Road), and turn right, the road will lead into Roaring Fork. You can also turn right at stoplight number 6 (Cherokee Orchard Road), and it will also lead you onto Roaring Fork. I could continue to wax poetic about this drive, but the Great Smoky Mountains Association certainly does a better job of it in their pamphlet. One last comment- there are many walks, strolls, or hikes you can take from any number of stops along the road. For example, stop number 5, Trillium Gap Trail is 1.3-miles, change in elevation 520 feet, up to Grotto Falls. Grotto is a 25-foot drop waterfall. You’ll be walking through a virgin forest of hemlock trees, American beeches, silverbells and maples. Roaring Fork Motor Nature Trail does not end up where you started. It will end on Hwy 321. If you turn right and go about 2.2 miles, then turn left you will be entering Glade Road, the beginning of the Great Smoky Arts and Crafts Community of Gatlinburg. It is an 8-mile loop road that circles back to Hwy 321 via Buckhorn Road. In 1937, several craftsmen and women decided they would invite tourists into their homes and sell their native arts and crafts including basket making, weaving, stool and chair making, quilting, brooms etc. Descendants of those families are still in business today, along with others, to total around 120 shops. 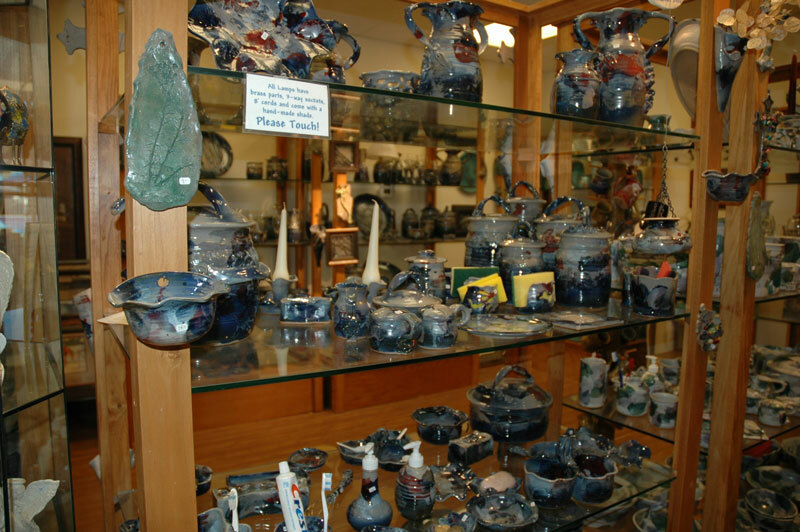 At one of your first stops, be sure to pick up the free map entitled Gatlinburg’s Arts and Crafts Community. It is a great map showing each store and listing what they carry. 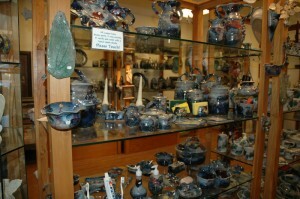 Stop number one is Buie Pottery. Buie makes some of the pottery I use at breakfast. There are restaurants along the 8-mile road. A quaint place for lunch is the Wild Plum Tea Room. If you are headed back to the “main drag” through Gatlinburg for dinner, four of my favorite restaurants are: 1. The Peddler 2. Calhoun’s 3. The Cherokee Grill and 4. Best Italian which are all grouped together at the upper end. The Alamo, which is close to the Arts and Crafts Community and seems to win awards each year. Coming back to the B&B, it is faster and more scenic to come via the National Park and Metcalf Bottoms Picnic area that to come via Pigeon Forge.